The Erfurt Synagogue is the oldest surviving synagogue in Germany and one of the oldest in Europe. It was completed around 1300 and only used as a synagogue for about half a century. In 1349, the Erfurt Massacre left many of the city’s Jews dead, and the synagogue became the property of the city. For the next six hundred years the building was used for a variety of purposes, largely storage. Thanks to its relative anonymity, the Erfurt Synagogue was overlooked by the Nazis and escaped destruction by the Third Reich. It is now home to a museum that houses Hebrew manuscripts dating from the Middle Ages. Also kept here is the Erfurt Treasure, a priceless horde of silver and jewelry that was abandoned by the Jews at the time of the massacre. The Rashi Shul Synagogue of Worms dates in part to the 11th century, though it had to be completely rebuilt after World War II. It dominated the ancient Jewish district in Worms for nearly a thousand years. Built in 1034 and rebuilt in 1175, it was the oldest synagogue in Europe until it was completely destroyed during the Kristallnacht in 1938. Its loss was one of the great architectural tragedies of the period. The synagogue was carefully reconstructed in the 1950s and 1960s, using as much of the original stonework as possible. It now houses a small museum. The Jewish Cemetery at Worms survived better than the synagogue. With gravesites dating to the 11th century, it is the oldest Jewish cemetery in northern or central Europe still in existence. For more than two centuries, the name Rothschild has conjured up visions of fabulous wealth and international prestige. The Rothschilds, an immensely influential dynasty of Jewish bankers and financiers, was for a time one of the wealthiest familes in the world. The Rothschilds owned a number of enormous residences in Frankfurt. While the oldest and largest was destroyed during the World War II, one of their other homes now houses the Jewish Museum of Frankfurt. The Jewish Museum of Frankfurt is not so much a Jewish Museum in the traditional sense as it is a collection of artifacts and artwork related to either Judaism or the Rothschilds. While there are exhibits on Jewish history and culture, there is also an art collection which includes works by giants such as Moritz Oppenheimer. The museum’s most popular exhibit is a scale model of Frankfurt’s Jewish quarter in the early 18th century. One of the greatest synagogues to survive the Holocaust stands close to the center of Berlin, the capital of the most violently anti-Semitic empire the world has ever seen. 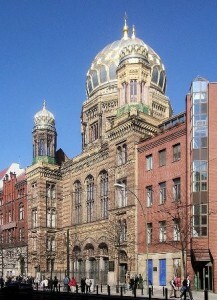 Badly damaged before and during World War II, the Berlin synagogue was spared complete destruction thanks to the efforts of the architecturally-minded chief of police of the city. Over the last few decades Berlin’s New Synagogue has been magnificently restored and has become a symbol of the triumph of humanity over religious intolerance. 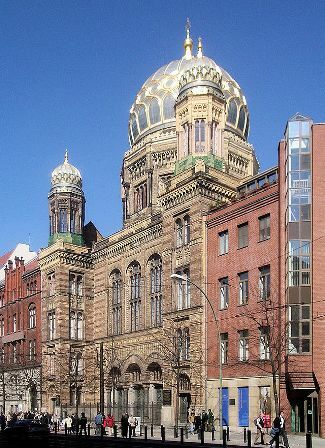 The New Synagogue, once the largest and most beautiful in Germany, was constructed by Berlin’s wealthiest Jewish families in the 1860s. Built in a magnificent Moorish style, the façade features intricate stonework. The whole is crowned with a great golden dome and two smaller flanking domes. However, these were mostly reconstructed in the 1980s and 1990s. The new cornerstone was laid down in 1988 on the fiftieth anniversary of the Kristalnacht. The interior is now primarily occupied by the Centrum Judaicum, a museum dedicated to the synagogue and the old Jewish community. Located next door to the New Synagogue is the remnant of an old Jewish cemetery. The Jewish Museum of Berlin is the largest such museum in Europe. The current museum is a successor to an earlier institution that opened in January of 1933, less than a week before Adolph Hitler came to power in Germany. Amazingly, the original museum managed to stay open for more than five years, but was finally shut down and looted on Kristallnacht. The current museum was opened in 2001, and is now one of the most popular museums in Berlin. It houses a fantastic exhibit on the history of the Jews in Germany, from their earliest settlements along the Rhine through the post-war period. There are also collections of artifacts and art as well as rotating exhibitions.